Full Kitchen Has appliances and tile flooring. Relax at the outdoor pool area. We have a Discount to Ober Gatlinburg for staying with us. Free Adult Ticket to The Magic Beyond Belief Show with our xplorie Package for staying with us. Free Adult Ticket to The Hatfield & McCoy Dinner Show with our xplorie Package for staying with us. Free Adult Ticket to The Smoky Mou ntain Opry Show with our xplorie Package for staying with us. We offer a Discount to Titanic when staying with us. Free Adult Ticket to The Ripleys Aquarium with our xplorie Package for staying with us. We have stayed at Bear Crossing many times and really enjoy it. All Condos have been nice. The only thing we encountered was the Master Bath shower drain is very slow and needs to be checked. Thanks and will be back. We appreciate you being a long time loyal guest with us at Bear Crossing. We are so happy that you enjoy staying with us. Please always let us know if you have a maintenance issue during your stay; the shower drain has been addressed. We appreciate your feedback and welcome you back to stay with us again soon. Thank you for your visit, great review, and comment. We are glad that you had a good time. We look forward to your return trip next year. the condo was beautiful...really enjoyed it!!! Stay at Bear Crossing many times and love it!!! Thank you so much for continuing to stay with us at Bear Crossing! We're happy to hear that you had another great girls trip in river view condo 204. We truly appreciate you and your kind comments, they mean so much to us. Thank you for your recommendation and for taking the time to leave us this fantastic review. We hope to see you again very soon! The rooms were very clean, and the property is centrally located to many activities and events. The kitchens are perfect for preparing food when you want to eat in. The overall experience was great. We are pleased that you had a wonderful experience at Bear Crossing Condos on the river in Pigeon Forge. Your comments are "spot on" in describing the unit and various activities. Since you had such an awesome stay, make your plans to return soon before we are booked to capacity. Thank you! Thank you so much for staying with us at Bear Crossing! We're happy to hear that you had a great vacation in condo 204. Nothing beats getting to sit out on your private balcony and listen to the water flowing by, it makes for such a serene atmosphere. We truly appreciate you and your kind comments, they mean a lot to us. We welcome you to stay with us again the next time you're visiting beautiful Pigeon Forge! We go to Pigeon Forge this same week every year. This year was one of my favorites because of Bear Crossing. The price was extremely affordable abd the condo was beautiful!! We will definately be staying with them again!! Thank you so much for staying with us at Bear Crossing! We are absolutely thrilled to hear that you enjoyed river view condo 204 during your annual Pigeon Forge getaway. Nothing beats getting to stay right in the heart of town and we're happy that you all loved the property. We appreciate you and your kind comments, they mean so much to us. We hope you'll stay with us again next year! We enjoyed the clean and homely feel of the room. Thank you so much for staying with us at Bear Crossing! We're absolutely thrilled to hear that you enjoyed river view condo 204 during your getaway. We appreciate you and your kind comments regarding the unit, they mean so much to us. 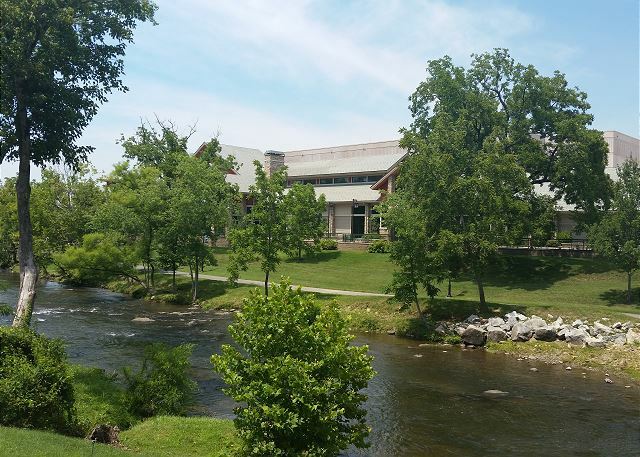 We hope you'll stay with us again the next time you're visiting beautiful Pigeon Forge! We truly enjoyed staying in 204 . Very nice condo . Thank you so much for staying with us at Bear Crossing! We're absolutely thrilled to hear that you had a wonderful family weekend getaway in condo 204. That is such a beautiful condo and we're so glad that you enjoyed it as much as we do. We appreciate you and your excellent review and we welcome you to stay with us again soon! Enjoyed the balcony and swing. Close to Dollywood and the island. Thank you so much for staying with us at Bear Crossing! We are happy to hear that you enjoyed our ideal location, nothing beats getting to stay right in the heart of Pigeon Forge. We're glad you were able to take advantage of the private river view balcony, it makes for such a serene atmosphere. We hope you'll stay with us again the next time you're visiting our beautiful area! This condo is perfect for your vacation in Pigeon Forge! It is clean & comfortable! The balcony overlooking the river is so relaxing & quiet! Will definitely stay there again! 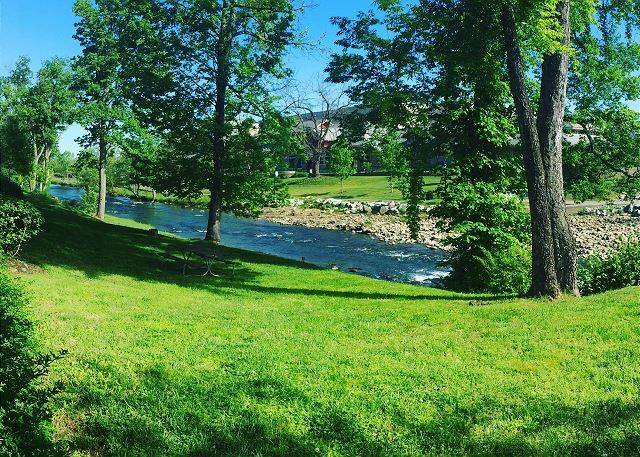 A great vacation should include some relaxation; glad you experienced that at Bear Crossing Condos on the River in Pigeon Forge. Since we are a perfect place for you, hope to see you again soon. Your comments are awesome. Perfect in every way. Just as we come to expect. Thank you so much for your PERFECT review of staying with us at Bear Crossing! Your patronage and compliments mean the absolute world to us! We hope to keep this yearly tradition as sweet as your kind comments. We greatly appreciate you and we will see you again next year! Have always enjoyed our stay at Bear Crossing. It is like being at home. Love the privacy and having individual bedrooms, and love love love the patio. Beautifully decorated. Absolutely loved this condo. There is nothing like sitting on the private balcony overlooking the river, is there? It's so relaxing. Happy to hear you all were able to enjoy it and had a nice trip to the area. Hope to see you again soon. The first time I stayed here, I brought my parents. The second time I brought my in laws. My family and I really enjoyed my stay here. The extra tickets are a bonus. I hope to come back and get this room again. Thank you so much for staying with us at Bear Crossing! We're so pleased to hear that you really enjoyed your stay and were able to take full advantage of the free ticket package. We welcome you back for round 3; we look forward to it! Fantastic location for food and entertainment. Very clean, comfortable and inviting. Very friendly staff and very professional. Currently have 3 reservations to stay at this property again. Thank you so much for staying with us at Bear Crossing! The location of our property, right next to the Island and Leconte Center, is a guest favorite and we love being able to hear how much everyone enjoys it. Thank you, thank you, thank you for the kind comments regarding our staff, it means a lot to us, as every department strives to make sure that your stay is exceptional every time. We're so glad to have you as part of the family and we can't wait to see you again soon! Loved the condo and it is in a perfect location! Convenient and easy walk to The Island and The Old Mill. Condo was very clean and well maintained. Would definitely recommend and will stay here again! Thank you so much for staying with us at Bear Crossing! It's reviews like these that instantly bring a smile to our faces, they mean so much to us. We're so glad you enjoyed the condo and the wonderful location of our property, it sounds like you definitely took advantage of being in walking distance of so many popular places. We appreciate you and the recommendation. We hope that you'll stay with us again soon! Thank you for staying with at Bear Crossing! We're happy to hear that you enjoyed your stay. We look forward to having you stay with us again! MY WIVE AND MYSELF ENJOYED THE ROOM AND STAY VERY MUCH, WE HAVE STAYED AT BEAR CROSSING THE PREVIOUS VACATIONS IN THE SMOKIES SEVERAL TIMES.WE LOVE STAYING THERE IT IS CONVENIENT FOR US IN EVERYTHING THAT WE DO.BOTH CONDOS WE HAVE STAYED AT THERE WERE GREAT.OUR VACATION WAS CUT SHORT THIS TIME BECAUSE OF DEATH IN FAMILY,BUT WE PLAN TO RETURN NEXT YEAR TO SAME CONDO.THE CONDOS ARE WELL FURNISHED AND THE PEOPLE THAT WORK THERE ARE SO HELPFUL AND PLEASANT TO DEAL WITH.WE WILL RETURN IF ALL POSSIBLE. THANKS! Lovely condo and especially an excellent location for the LeConte Center..not our first time here and plan to continue staying at the Bear Crossing! Thank you so much for this excellent review. Pleased to hear you loved the condo and location. Hope you all had a blast at the National Quartet Convention and we look forward to having you vacation with us for the next one, thank you! The overall expectation was exceeded when we walked in the condo.The place was very comfortable for the 4 of us was almost like it was our home every time we returned from our many outings each day we were there. We are glad that you had a fantastic vacation at Bear Crossing Condos on the River in Pigeon Forge, TN. We look forward to your return to your almost home away from home. Thanks for your perfect review. This condo is decorated so beautiful yet comfortable. The only problem was trying to figure out how to operate the TVs. Our TV's can occasionally be a bit challenging, but our Maintenance Department can help you if you will let us know. They don't mind at all. We appreciate your visit, review and comments and look forward to your return. We enjoyed our stay at Bear Crossing 204. Location was great. Close to the Parkway. Convenient to everything. The condo was clean. Very comfortable. Loved sitting on the balcony and watching the fireworks from Dollywood at nite and listening to the creek that is behind the condo. We spent one day at Dollywood which we really enjoyed. Went to the Comedy Barn which was hilarious! We also went to The Soul of Motown show andbit was Great! Loved it! Went to Bush Best Museum and that was very interesting and the restaurant there is very good! Also went to Parrot Mountain and the Birds there are so pretty! Enjoyed that also. And of course did shopping at the Tanger Outlet. We had a Great time and having a nice, clean and comfortable condo to come to at the end of the day made it so nice. Thanks for making our trip Great! We will be back. Happy Belated Anniversary! Thank you for your wonderful comments; sounds like you had a great time and a busy time, also. We are glad that you enjoyed many activities while you were here and will return. Thank you for staying with us. We appreciate your great review and comments. We hope that you will make plans to stay with us again. We had a great time in our Bear crossing condo. The condo was spacious and convenient to all the attractions in PF. However, the pool was a disappointment to my grandchildren. Should have checked it out better. I would recommend this property if you don't need a pool. Thank you so much for staying with us and we are happy you enjoyed your stay! Our Whispering Pines property has an big indoor and outdoor pool, and a lazy river! Come back and see us again soon! We really enjoyed the room. It was very nice and we loved the swing on the balcony. Great! Nothing like hanging out on the balcony and enjoying the river going by! Hope you stay with us again soon! Wonderful! Isn't it great when you find a condo that really works for you? We appreciate you staying with us! See you again soon hopefully. A great place to stay in the heart of it all. This property is close to so many things. The room was clean, decorated nicely and well equipped. The most surprising was how comfortable the beds are. Thank you for choosing Bear Crossing for your recent stay in Pigeon Forge. We appreciate your kind words and review. We look forward to seeing you in 2017. We were very happy with our accommodations @ Bear Crossing. Beautiful condo. Only one recliner though - would have preferred two. We are glad that you were happy with your accommodations at Bear Crossing Condos on the River in Pigeon Forge, TN. Whenever you make a reservation, get us to check to see if we have available condos that have 2 recliners. We would be happy to do that for you. We appreciate your visit, excellent review, and comments. We look forward to your return. Thank you for staying with us at Bear Crossing. We are happy to know that you enjoyed your stay and the awesome river view. We appreciate you and look forward to seeing you again. The condo was very nice. Wanda Ruth and Julie made our stay even better by being friendly and making sure everything was satisfactory. We took advantage of a free ticket to the Smoky Mountain Opry and really enjoyed the show. We are looking forward to our next visit! Great! We look forward to having you with us again and we are glad you had a great time! Thank you for staying with us at Bear Crossing. We love hearing that you had a great experience in condo 204. We look forward to having you as our guest again soon. we have been staying at Bear Crossing for several years and if we have another opportunity to visit PIGEON Forge again we will stay at BEAR Crossing. Thank you! We appreciate your business and look forward to having you stay again. It was a lovely week. Very close to,all activities. The deck needs cleaned in between visitors. There was bird poo all on the railing, and there was spider webs everywhere. The railing needs painted. The blinds on the sliding doors need to be upgraded or fixed to move better. So happy to hear you enjoyed your week at Bear Crossing. I will pass along your comment about the sliding door blinds to the owner-they do try to do everything they can to ensure all their guests have an enjoyable stay. Thank you for staying-hope to see you again! Bear Crossing is an amazing place to stay! The rooms are always clean and well decorated. The area is quiet. We love the easy access to the parkway. The balconies over the stream provide lots of relaxation. The staff is always courteous and helpful. To ensure we always get to stay at Bear Crossing, we make our return reservations when we check out. I have recommended Bear Crossing to many friends and they were all extremely pleased. Thank you for recommending us! Thrilled to hear you enjoyed another stay at Bear Crossing. We agree on your comment about the river-it certainly is relaxing. We are blessed to have our Bear Crossing property and love that we can be a place that people return to year after year to enjoy all that Pigeon Forge has to offer. Thank you for staying and we hope to see you again soon! Had a great time at the Dolly and Shrine parades. Had a great vacation and this is the best place to stay. Always clean and has everything we need. My family and I stayed in condo 204 in early April 2016. The condo was well maintained and clean. It was a wonderful experience. We will be returning here in the future. Thank you for taking the time to submit your review. We are so pleased to hear that you and your family enjoyed condo 204 at Bear Crossing. We look forward to your return visit. The location of the property is great. We love the unit we stayed in. Wish they had someone a little more pleasant in the on-site office. Thank you for staying with us at Bear Crossing. We are so glad to hear that you enjoyed 204 and our great convenient location. Customer service is a top priority at Resort Properties Mgmt. We apologize that you were not treated more pleasantly at our office. We will be discussing this with our staff. Thank you for your review and we hope that you will visit us again. 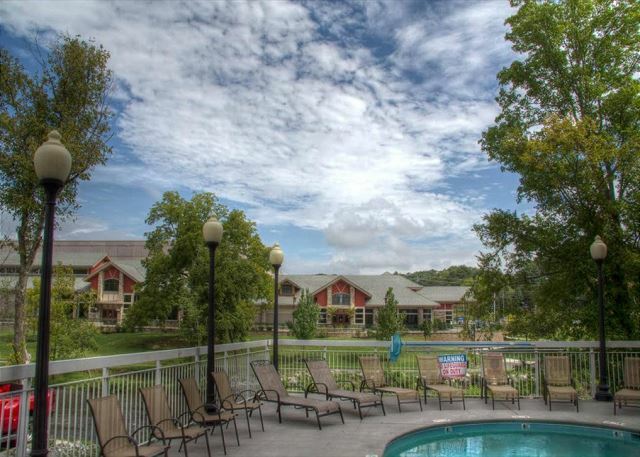 Thank you for your great review of unit 204 at Bear Crossing Condos in Pigeon Forge, TN. We are glad that you had a wonderful stay and that you plan to return. Property was as described. Plan to stay here again! Great! We are glad that you enjoyed your stay at Bear Crossing Condos on the River in Pigeon Forge, TN. We look forward to your return visits. Thank you for choosing Bear Crossing for your Valentine's Weekend getaway. We are so happy to hear that that you enjoyed your stay . We appreciate you and hope that you will visit us again soon. We loved our stay at Bear Crossing room 204. The location was great. We were near Teaser Lane so we could avoid a lot of traffic. We were able to walk to the Island. The room was nice and clean. The river off the back deck was nice and relaxing to listen to. Check in was easy. We will stay here again! 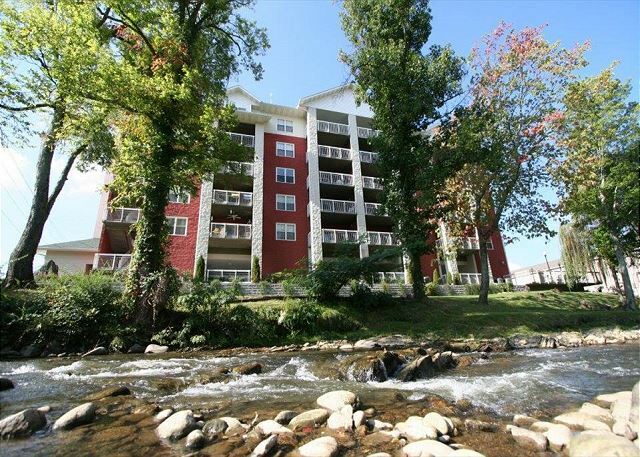 Bear Crossing Condos on the River is centrally located in Pigeon Forge, TN. Your excellent review is appreciated. See you next time. We could not have asked for a better rental than ones at Bear Crossing! Beds and furniture were so comfortable! Have stayed twice at this location and love the convenience to walking trails and restaurants! Only suggestion would be to replace bath mats with ones that can be washed. Thank you for your feedback! We are pleased to hear you continue to enjoy your stay with us at Bear Crossing and all it has it offer. We appreciate your patronage and look forward to your next visit. The ONLY complaint was with the TV. There was a channel listing on a laminated piece of paper on the table, but the TV itself did not have a guide. If you turned on a movie, you could not tell if it just came on or if it had been on for an hour. You could never see what or when anything was scheduled. Other than that, everything was wonderful! Thank you for your feedback. We apologize for the TV Channel guide issue. We encourage all of our guests to contact the front desk whenever they have any concerns during their stay. We would have been happy to send maintenance up to help with the TV. We are pleased to hear you enjoyed your stay otherwise! Thank you for staying with us and we look forward to your next visit. My family and I were very pleased with everything and will definitely be staying here again. The only thing I would change is that on the first night we arrived, the employee at the front desk did not mention anything about returning the movie card . Luckily, I finally found the movie card and was not charged the $25.00 fee if not returned. Thank you so much for staying with us at Bear Crossing. We are happy to hear that you enjoyed your stay. We do apologize that you were not informed at check in about the Free DVD rental card and that it had to returned when checking out. We appreciate your business and hope that you will visit us again soon. 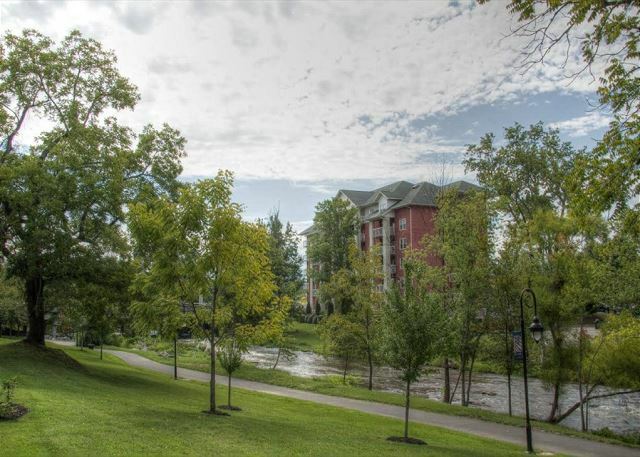 Great location, great condo, and easy check-in and out experience. All basics were provided in the condo. Both bedrooms were a nice size with closets and more than enough for my daughter and I. We loved patio and enjoyed breakfast there each morning. We were only in Pigeon Forge 4 nights so we were not in the condo much but it was great to come back to the comfort of a clean cool condo. Decor was very nice, tv's worked great as well as DVD player for late night movie. We rented from redbox at the Walgreens right next door. Location was a BIG PLUS - take the back road to avoid the traffic on the main road. We used a couple of the free tickets provided - Aquarium (awesome) and the Lumberjack show (fun) We would definitely rent this condo again. Thank you for sharing your place! We forgot to start the diswasher when we checked out as we did not see the e-mail reminder until we got home. Suggest putting a tent card on the counter to remind guests to do this. There were very few dishes and they could have been we apologize for this oversight on our part. Thanks again! Thank you for your feedback! We are pleased to hear you enjoyed your entire experience at Bear Crossing! We appreciate your patronage and look forward to your next visit. We had a wonderful time in this condo. Nicely decorated, had everything we needed. Very comfortable and safe place to stay!! Definitely be returning soon!! 1. The property description was accurate regarding the location, layout and amenities. 2. I really enjoyed my overall stay. Even though I was hardly there during the day it was a nice place to come back to at night to relax. In the mornings, I would go to the balcony and sit in the swing to enjoy the sounds of nature. 3. The condo was in a great location. It was located near a small river and behind Walgreen's which I visited quite frequently. If I wanted to walk to certain places I was able to do so. Plus it was close to a back road so you don't have to travel on the busy parkway. 4. The condo was really clean. The beds were comfortable. They were so comfortable I had a hard time getting my husband out of bed in the mornings. My parents were also impressed with the condo. I hope to rent this condo again if I visit Pigeon Forge again. I love the decorations and leather furniture. The swing and the table on the balcony was a really nice touch. 5. The vacation rental management staff was very friendly. 6. The property was very clean and well-maintained with the exceptions of some cigarette butts in the grass near the river. 7. I would recommend this property to a friend and relative. 8. The free tickets and coupons was a nice perk. I did enjoy the pizza place near the condo. We are so pleased to hear you enjoyed your entire experience at Bear Crossing. Thank you for staying with us and we hope to see you again soon. A family vacation to celebrate Mother's Day. We enjoyed family time, good food and fun with our grandsons. Thank you for spending your Mother's Day weekend at Bear Crossing Condos on the River unit 204. Everything was great. Beautiful condo with easy access to LeConte Center. Great deck overlooking a peaceful stream. Thank you for your comments. We appreciate you visit to Bear Crossing Condos unit 204. The view and sound of the stream provides a very relaxing atmosphere. Come again. We've already made reservations for 2016. The location is great(it's in the middle of everything and somewhat isolated). The rooms are very well laid out with plenty space for everyone. Best of all, the people at the front desk are very nice, helpful, considerate, and knowledgeable. Thank you for your wonderful review. We appreciate your patronage and look forward to your return visits. This unit was wonderful. He had a group of 6 and was very comfortable. Condo was very clean and nicely furnished. Loved the location and the view of the little pigeon river. Will be returning!! We are pleased to hear you enjoyed your stay at Bear Crossing! We appreciate your patronage and look forward to your next visit. This was a fabulous place to stay. We took our teenage daughter and one of her friends so it was great to have two bedrooms and two baths. We are so excited to hear that you, your daughter and friends enjoyed staying at Bear Crossing. We really appreciate you and your generous comments. Please come back and stay with us again soon. The condo was exactly as advertised. It was very clean and the furniture was very nice. The beds were also very comfortable. Sadly it was cold while we were there so we did not get to enjoy the balcony overlooking the river as much as we wanted to. Glad you found the unit at Bear Crossing as advertised and that you were comfortable. We apologize that you did not get to enjoy the balcony and the river view; we have definitely had our share of cold weather the last few months. Spring is just around the corner. Come back and visit. Loved, loved, loved the condo. The unit we rented was decorated comfortably yet beautifully! Even the deck was decorated. Couldn't ask for a better location with a light to enter and exit. Will definitely stay in this unit again! Thank you for your feedback! We are pleased to hear you enjoyed your stay at Bear Crossing in condo 204! We appreciate your patronage and look forward to your next visit. We could not have been more pleased. This is SO much better than a hotel stay. It was well stocked with everything we needed. We had to leave early because of the weather, but we want to come back to the same condo. Thank you so much. Having the check out rules available in the condo would have helped us. We did not know we had to take the trash out ourselves until we got home and read your message. We are so happy to hear that you enjoyed your recent stay at Bear Crossing on the River. We hate to hear that you had to leave early due to weather. Please let us know when making your next reservation and we would be glad to take your request for 204. There is normally a reminder on the dining room table telling you what to do before check out. If you ever have a question please feel free to contact the front desk because we are always willing to help. Thank you for your review and we look forward to your next stay with us. The condo was wonderful. Location was great. Staff was very friendly and helpful. We love the decorations,style and location of the condo. Best Stay Ever! We are so glad you found us and enjoyed the condo! We look forward to seeing you in the future! For several years we have stayed at RPM and all three locations have been great stays. Especially like BC and this time our 204 unit was top notched. Upscaled decor and very comfortable. Love the balcony over river stream. Check-in is easy process. BC is convenient to all activities/dining, etc. No hesitation in recommending this company. Nice people to work with regarding reservations. Thank you for this review! We are glad you love our properties & Bear Crossing is a very convenient location with absolutely beautiful condos! We hope to see you again soon! Glad you were able to enjoy Bear Crossing and your two bedroom condo! Thanks for staying! next time, I will check the dates on my email! We are so happy to hear that Polly and Lou Ann took great care of you when you had a reservation issue. We really thrive to offer great customer service to all of our guests. Thank you for staying with us and hopefully we will see you again next Labor Day if not before. Thanks for taking the time to post a review. We are so happy to hear that you had an awesome stay at Bear Crossing. Thank you for your review. We hope to see you again when visiting the Pigeon Forge area. Very nice condo. Clean and great décor. Would definitely stay again. Thank you for taking the time to post a review regarding your stay at Bear Crossing. We are so happy to hear that you enjoyed your stay. We hope to see you again the next time your in the Pigeon Forge area. Beautiful Condo and Family Vacation! This was the cleanest and the nicest condo we ever stayed in! We rented 2 condos for all of our family. They both were very clean and beautiful! We stayed in 204. Beautifully decorated! Housekeeping should be commended and you can tell they take pride in their work! The condos are very roomy, convenient, quite and location was great! Staff was wonderful , friendly and always helpful! Bear Crossing will be our home away from home from now on when we visit Pigeon Forge! Awesome! Thank you for choosing us! We absolutely consider our guests our extended family. We appreciate you and look forward to seeing you again soon. Stay Safe!